﻿ Illustrated account of life in Vietnam today. An intriguing account of life in Vietnam today with over 200 photos. Pam Scott looks back on the remarkable changes she witnessed in Vietnam over the last two decades. Her long connection has given her a deep insight into this fascinating country and its people. As well as giving an update on her beloved city of Hanoi as it celebrates its 1000-year anniversary, she takes the reader on an in-depth tour of Hochiminh City and many provincial side trips. 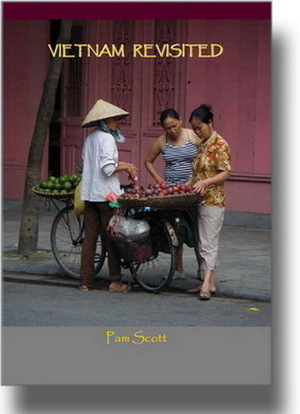 She also writes about Vietnamese women whom she has come to admire so much, and about the historical forces that have shaped Hanoi and Hochiminh City. This profusely illustrated book provides a fascinating, and at times hilarious first-hand account of a country leaping into the 21st century. Soon also available from Gioi Publishing, the Vietnamese foreign language print publisher. 'A fortune teller in Hanoi once told me I should stay in Vietnam until 2009. "He says it's like a fairyland for you," my friend, who was acting as interpreter, told me. I wasn`t sure what that meant but it sounded good. 'I feel so lucky to have lived in Vietnam during this remarkable time, a period of peace and incredible change. The rate of change was so rapid, and yet the social fabric was not destroyed, as could easily have been the case. By and large, Vietnamese people have held on to their culture and proud traditions, and seem determined to maintain a peaceful unity.' Pam Scott PDF only.